To solve real business problems, know how their kids are doing. Occasionally that’s the response I get when I ask a new colleague to go out for an offsite lunch. And it’s true, there’s a fabulous, healthy, cooked lunch served daily here at Indeed in Austin. But I’ve only actually tried it once so far. That’s because I’m spending my first few weeks going out to lunch one-on-one with colleagues in my department and other departments. It establishes trust. Trust is the basis on which teams operate efficiently. If you don’t have trust you have disfunction, and you can’t compete. Life is too short to work in an environment of low trust. If that’s where you are, you need to fix it, or get the hell out. If you don’t understand this already then read The Five Disfunctions of a Team, by Patrick Lencioni. So you can see the person behind the title. If a colleague is merely a name and a title to you, then you don’t really see them as a person. And if you don’t see them as a person, it’s way too easy to make attribution errors – to assume (often incorrectly) the reasons for their choices and behavior. It’s human nature. So they can see you instead of your title. It works both ways. You want them to know you – not just the role you fill in the org chart. You don’t want them to make assumptions about your priorities, your willingness to be flexible, etc. It makes work way more fun. It’s great to know people and to have people know you. We’re social animals. Introverted or extroverted – it’s nice to be surrounded by people that you know. You’d be amazed how transformative it can be to work in a place where people know each other. So how do you get to know your colleagues? 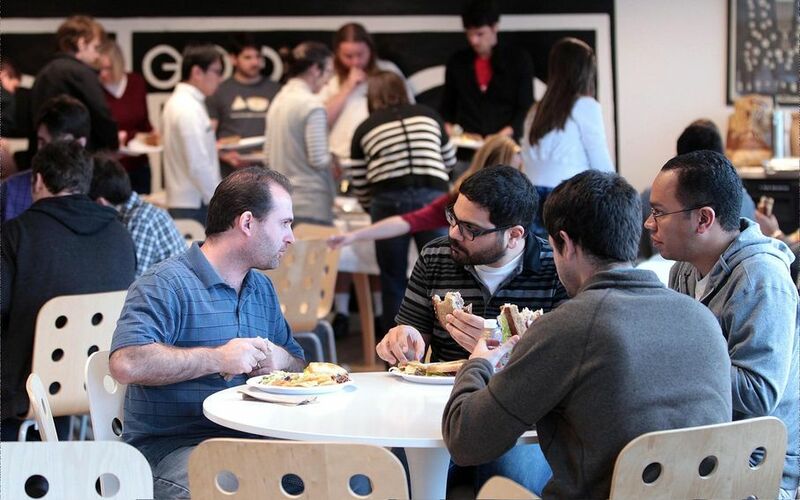 Easy – invite them out to an offsite lunch. I make sure to do this face-to-face, explaining that I’d like to go out to lunch so we can get to know each other better. Then I follow up with a meeting invite. Since the purpose is to spend some time together, I set the invite for at least 1.5 hrs. Be sure to travel together in one car – already you’re sharing someone’s non-work space and you learn things like whether they have young kids. Then just enjoy lunch and ask them about their history with the company, their history before the company, what they like to do in the city, etc. Volunteer the same information. Imagine the difference this makes in your first difficult conversation with a colleague in your new role. Traditionally, this might be the first time you and this person have had direct interaction or conversation. You’re strangers, and now you’re having a tough conversation about how your team accidentally brought down the site for 10 mins last week. You’re defensive. There’s not mutual trust or understanding. It’s a lot harder to collaborate. Now imagine that you’ve already been out to lunch together a few weeks ago. You know their work history, that they’ve got young kids, etc. They know a little about you and that you’ve got the business interests at heart. It’s much easier to not be defensive and to work collaboratively. Some companies already know how important this is to their business – so they offer structured programs encouraging colleagues to go have lunch. Who should you invite? If you’re a manager start with the folks who report to you. Then your peers (the folks who report to the same person you do). You should already have had this kind of lunch with your new boss before you accepted the role, so you can skip them. Then look at any standing meetings you attend – these are the people you work with and will need to make decisions with – invite them. Then consider peers in other departments – knowing a person or two in sales, marketing, hr, ops, support, etc can make coordination much more effective. But you don’t really need to go overboard and do this with everyone – unless you really enjoy it (and some folks do). When I first started doing this at a past company, I would invite colleagues out to lunch, and would pick up the tab (I thought this was necessary because I invited them). Sometimes I would expense it, and sometimes I wouldn’t. But this could get expensive and is not really necessary. I learned to be more comfortable asking folks out for lunch, and being comfortable splitting the bill. It’s easiest to do this when you’re new. That’s why I suggest you start doing these lunches whenever you join a new company or start a new role – and you keep doing them until you run out of people to invite or money. This entry was posted in Uncategorized and tagged management. Bookmark the permalink. 1 Response to To solve real business problems, know how their kids are doing.